10 Visitors, 0 Member, 0 Moderator, 0 Administrator online users. Thanks for the measrement. According to Newegg, the 1200 is about a 1/4" wider than the 300. The side panel fan should be below the HS- it's almost directly on the GPUs. Looking at my one 1200, the side fan should miss by an inch. I think the 300 and 900 were 8.1 and the 1200 is 8.4. The sidefan on the 300 is over the gpu's so it clears fine. I should have mentioned that I now have one on my Q6600 as well. I had a Tunig on it before (I think I said earlier in the thread that it was something else, got my wires crossed). CPU temps dropped several degrees with the Promatech. I've got some more fan clips ordered and will add a fan to the exhaust side of the heatsink to see what kind of difference it makes. When I pull that down I'll check the measurements on it as well. If you do order the Prolimatech you might order an extra set of fan clips in case you want to add a 2nd fan. You said you were getting the 1200 because you're getting a larger power supply. I thought all the ATX power supplies were the same physical size? Height and wide are critical for installing a power supply in a case. But length doesn't import so much, so a lot of high-end power supply are lenghter than the ATX norm. In fact very few 1 Kw+ power supply follow the ATX norm. This one is being upgraded from dual 8800 GTS 512's to dual GTX260/215's. The main issue is all the extra cables. Old PSU has 2 PCI-E cables, new one has 6. There are more of the other cables as well, and the 900 just doesn't have room for them. The box of the new one is also a bit taller, and would block off half the air intake to the lower GPU. The 1200 moves that up a few inches. I'm going from a 650W to an 1100. The 1200 I have uses that PSU for the dual GTX260's it's running. Along with just being bigger, the 1200 has much better cable management. I measured the Q6600 on an IP35 Pro mb and the measurements are exactly the same as the K9A2. I added a 2nd fan on the exhaust side of the heatsink. Temps dropped from 42c to 36c idle and 56c to 50c while folding 4 cores. Definitely worth the effort. Maybe some more headroom for overclocking. The 2nd fan fits fine but the spring clip was a bit difficult to attach. I needed a spring hook to grab the bottom of the clip to pull it over the fan. Finally installed this stupid thing- in a totally different build. It's been running for a couple weeks, but I just hit my OC goal. Currently just running one 8800 GTS 512, but plan on dual 400's at some point. RivaTuner says ambient at gpu is 59C. Running a 6015 @ 100% gives me 72-80C on the cores (Core Temp). That's a 12-20C rise at full load with an OC of 1.2GHz (43%). Idle was around 45C. I'd have to say this is a sweet "little" cooler. I have not used this heatsink but I recently set up a Phenom II 955 BE for a friend and we used a Red Scorpion from Zigmatek. The temps so far have been around 26c at idle but haven't checked load temp yet, it is also VERY quiet. The Prolimatech Megahalems is very good, especially for a lower profile model, but several heatsinks score better according to www.frostytech.com. I have two NH-D14 and one NH-U12P-SE2. The latter is more quiet, but D14 performes better. 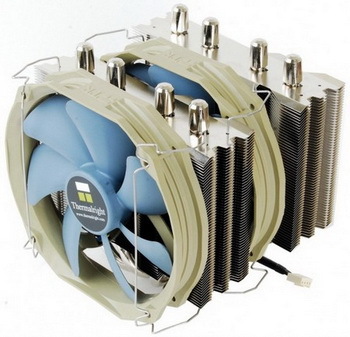 Noctua still rocks, but for even better performance - go for an Thermalright Silver Arrow. Be Quiet! and welcome the Dark Rock Pro, 7 heatpipes, 1550g ! !